It’s a challenge every four-wheeler faces at some point: Should you hold onto the current vehicle or replace it? If you’re like most four wheelers you’ll hang on as long as possible. Something breaks, and you replace it. Another part snaps, and you head to the store. Or you take the vehicle to the shop. This goes on ad infinitum, which is Severin-speak for “way too long.” Adding to the conundrum is that you’re probably really attached to your vehicle. Replace with another Grand Cherokee. I would’ve gone with a ’98, the last year they made the ZJ line. The advantage there was I could move many of the parts from the old JGC to the newer one. A ’98 in good condition would cost about $2,500. Upgrading that, even with the old parts, would cost about another $3,000, though that’s a rough estimate. I would’ve hired out for some of the work, I’m sure. Buy a newer and different model. The first step was research. I looked at what the newer models featured (or needed) in terms of solid axles, reputation of the axles housings, possibility of 4 doors, body on frame, and such. I eventually settled on a 2004 TJ Wrangler (often called an LJ). Part of the reasoning was the ZJ and the TJ share the same axle configuration. The upgraded axles from the ZJ would bolt right up to the TJ. Still was an expensive move. The vehicle, which had 98,000, cost $10,500. Upgrades set me back another $17,000. You can no longer share parts. All the other drivers have newer vehicles with different frame or body styles. You can pack certain parts, but you can’t possibly pack replacements for all that might break down. In the past you could possibly count on a buddy’s vehicle to “donate” a part. No more. As a result of the above, you skip the rides. Your buddies call about a weekend outing, but you stay home. The trail is farther away and more remote than you care to go. The vehicle is in the shop more than it’s on the road. It’s nickeling and diming you to death. But those are some big nickels and dimes. The net effect is you’re not out on the trails as often as you could or should be. Repairs cost more each month than the loan payment on a new vehicle. Maybe you hate taking out loans. What’s worse – dumping money into an old and worn out vehicle, or paying down the loan on a new one? Your needs change. Now you’d like A/C or some new gadgetry. Or you now have a family and certain safety features are important. Is your 4WD machine bleeding your bank account dry and robbing you of quality time on the trails? Raise a toast to what was, take her to the junk yard, then turn around and get another vehicle. You deserve it, so just do it. All colors are back in stock! 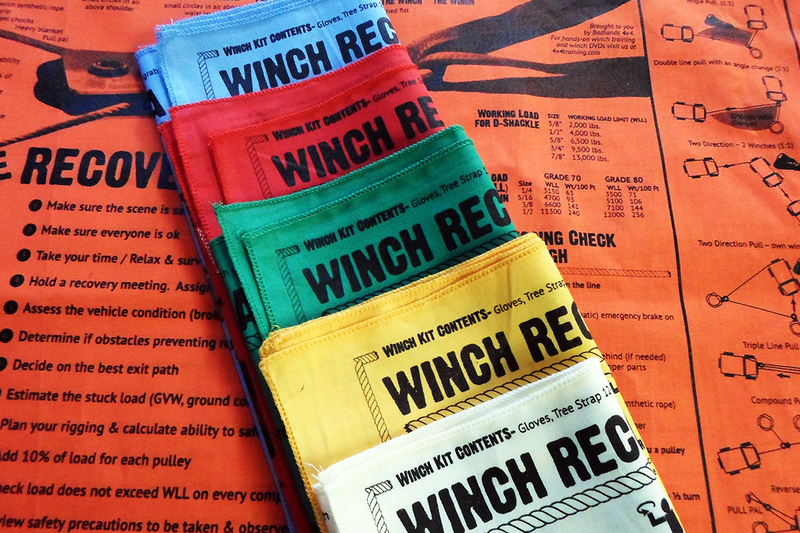 To celebrate, we will send a Winch Recovery DVD with every Bandana order for a limited time. Limit 1 DVD per order.